EP 10 Live Show Updates and Discussion- Probable football delays! Topic: EP 10 Live Show Updates and Discussion- Probable football delays! Re: EP 10 Live Show Updates and Discussion- Probable football delays! ETA - Hey! I was going to say that! I am here with my blankie, tissue, chocolate, and vodka just your basic supplies. I need alcoholic beverage as well. Time for me to boycott this thread till I can get a youtube uplink. No depart times? First to arrive will be the first to depart. What is that? Dallas is the first to use the pictionary skills. No points for me. I think I may need one or two or three to cope with this--I am SO nervous! Oh my gosh--there is not one bite of chocolate in my house! 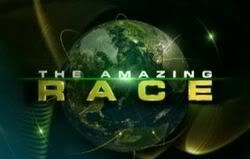 The dumbest team ever to participate in The Amazing Race now departs. We have no idea what time. The graveyard is before the flat! all bunched at the sub. Dandrew nowhere to be seen. Hmmm..
Traffic ties down the first three teams. So far, everyone has their fannypacks and passports. antique book store, peach knows her antiques! Hell we all know G-Man. Toni gives Dallas the pack with the money and passports !!!!!!!! Wow, this roadblock is tough. Counting the statues of Stalin and Lenin, using the Cyrillic spellings. Then when they get the correct number (62), teams must go to a bookstore to get a book to tell the correct number. If correct, they get a book and then turn to page 62 and find out their next place. If wrong, teams must wait 10 minutes to try again. Dandrew were taken to Victory park! MISTAKE!! Is this the key to the race? ?